How much does it cost to travel to Ushuaia? How much money will you need in Ushuaia? 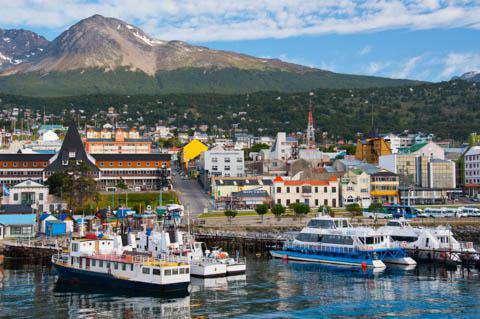 AR$7,900 ($190) is the average daily price for traveling in Ushuaia. The average price of food for one day is AR$1,509 ($36). The average price of a hotel for a couple is AR$7,793 ($187). Additional pricing is in the table below. These average travel prices have been collected from other travelers to help you plan your own travel budget. How much money do I need for Ushuaia? Ushuaia is a city on the Tierra del Fuego island of Argentina on the Beagle Strait. The city is considered to be one of the southernmost cities in the world and is often used as a base for cruises to Antarctica. Ushuaia's close proximity to Antarctica and their amazing hiking trails have made it a popular tourist destination over the past few decades. Although Ushuaia is the southernmost city in the world, it doesn't get all that warm. During summer, from November through February, temperatures tend to stay around 50° Fahrenheit. March through October tend to get colder, with temperatures between 15-20 degrees. Ushuaia does experience a Patagonian climate, meaning they get very strong winds that often add a big wind chill factor. Ushuaia's best sights tend to be its museums, some of which are located in very interesting places, such as the Museo Maritimo. The Museo Maritimo is located in the old prison that was shut in the mid 20th Century and gives a history of the Tierra del Fuego island. Adjacent to the Maritimo is the Presidio, a museum dedicated to the historical military prison and features an entire wing with artwork from local artists. The Museo del Fin del Mundo has the largest exhibit of birds from Tierra del Fuego, a figurehead of the sunken ship, Duchess of Albany, and a library dedicated to the history of Tierra del Fuego. Nearby is the Museo Mundo Yamana where you can learn about the original inhabitants of Ushuaia, the Yamana Indians. Here, you'll learn about the life, origins, and migration of the Yamana Indians as well as what drove them out of the area. Ushuaia is a fairly small town, with the city center being the place where you'll find the major tourist attractions, accommodations, and restaurants. Maipu Street is where you'll find a few tour companies, such as Double Decker Ushuaia which has exclusive contracts with some areas of the city so you end up getting a great, in depth, tour of the city! Another interesting area to explore is the naval neighborhood located west of the city center. This is where the Argentina Navy, and some missionaries, were based and where you'll find beautiful remnants of their architecture. Outside of the city center, you'll find the Tierra del Fuego National Park and the Martial Glacier. There are a couple of restaurants and accommodations at the glacier and just outside of the park. One of the most popular activities in Ushuaia is the Martial Glacier who's summit provides incredible views of the city and the Beagle Channel. You can either take a chair lift to the Sendero del Bosque path then take a 15 to 20-minute walk to the summit. Or, you can hike from the base to the summit in about an hour, depending on experience level. Another great spot for hiking is the Tierra del Fuego National Park, where you'll find many well-marked trails that range from small day trips to multi-day treks. There is a fee to enter the park, students receive a discounted rate. One of the best ways to enjoy the sights is from the Beagle Channel on sailboat from Motonave Barracuda tour company. The sailing trip takes you through the channel where you'll get incredible views of the mountains and may catch a glimpse of the sea lions and penguins indigenous to the area. If you want your adventure on the water to last longer, you can book last minute cruises to Antarctica through Freestyle Adventure Travel Company. Due to Ushuaia becoming a major tourist area, cuisine here tends to be more international, with strong Western European inspiration such as Italian and French. Some restaurants, like Altos Resto combine these international dishes with traditional Patagonian cuisine. Patagonian food tends to focus on meat, especially lamb, and is often cooked over a spit. Smoked trout, smoked wild boar, cheese, and seafood are very popular Patagonian dishes. There are a decent number of bars in Ushuaia, most of them are pubs that have an Irish flare. The Malvinas Argentinas International Airport is near Ushuaia, with all flights being from Aerolineas Argentinas airline. Keep in mind that you must purchase your ticket in person from the Aerolineas Aegentinas office, they do not sell tickets online. Buses run from major cities in Argentina to Ushuaia, although this is often a 12 hour plus journey as you have to drive through Chile, back to Argentina, then take a ferry to Tierra del Fuego. City buses are available, although they do not go to all attractions. There are tourist buses which you can arrange a ticket for at the tourist office or from your accommodation. Minibuses run daily from the city center to destinations such as Glacier Martial and the Tierra del Fuego National Park. Taxis, car rentals, and bicycle rentals are other popular options for getting around Ushuaia.